Cox has abandoned its over-the-top service FlareWatch, which only launched around the start of July (link is to my initial post on Flare). The trial of the service ends 27 September 2013 and "Becky" from Cox Customer Care reports that the company will refund customers for their out-of-pocket costs for the service (e.g., equipment). Confirmation is in the tweet below. I believe this news has yet to be reported anywhere else. 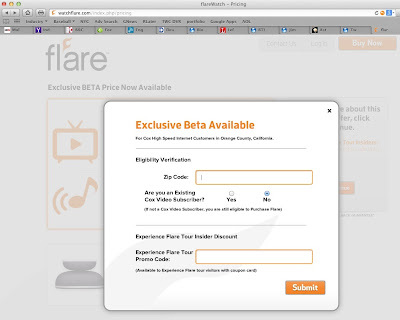 A reader of this site and potential Flare customer, Teddy Wong, contacted Cox about subscribing to the service in early September and reported that his "order was cancelled without notice". Certainly not the response one would expect from the cable incumbent with the top reputation for customer service. 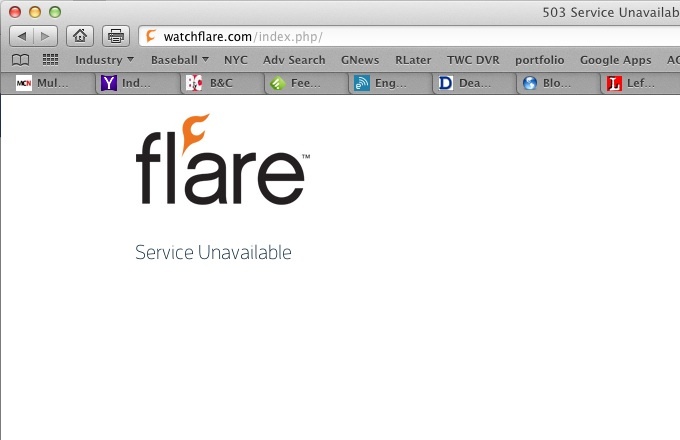 Prior to Cox's tweet, an attempt to access the website for the service, watchflare.com, yielded a page with the logo and the message "Service Unavailable", and a "503 Service Unavailable" error message, although through Google I can still reach the page with the Flare pricing and information about the service. Broadcasters and cable programmers have notified Cox that they have not granted rights for such a service. 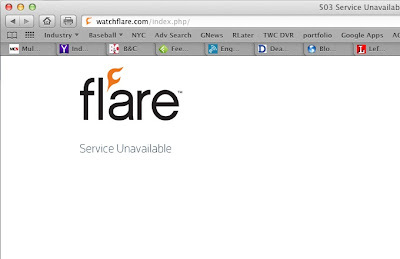 As I noted in the earlier post, I believe that Flare is an unprecedented service. While many cable operators offer some, most or all of their cable TV lineup to devices other than traditional televisions (e.g., web browser, iPad, Roku apps), all of them are providing it as "added value" to cable TV subscribers who also subscribe to the operator's cable Internet service. None are offering it as an alternative. The major broadcasters and cable programmers like the current pay-TV ecosystem and could be threatened by (and unwilling to support) any new precedent. The only over-the-top service from a traditional operator is Dish's DishWorld service which is delivered via the Internet to Roku boxes, Macs, PCs and several other devices. DishWorld, however, does not deliver any household name US cable or broadcast services. The closest thing to such a service on its lineup is Bloomberg TV, which itself is streamed online at bloomberg.com. Most of DishWorld's 13 English-language channels are all from international programmers (e.g., France 24, RT [formerly Russia Today], Euronews). Update (3 October 2013): Erik Brannon of IHS speculates/calculates that Flare was shut down because it wasn't profitable enough. This theory does not ring true to me; Cox certainly knew the margin on the service before its launch and could have priced it higher to address this concern. Brian Santo's post in CED sees through the IHS analysis, and adds quotes from Cox which also deny Brannon's speculation. Update (1 November 2013): Cox is evaluating a next-generation IP video service (like Flare) per Steve Donohue in Fierce Cable. 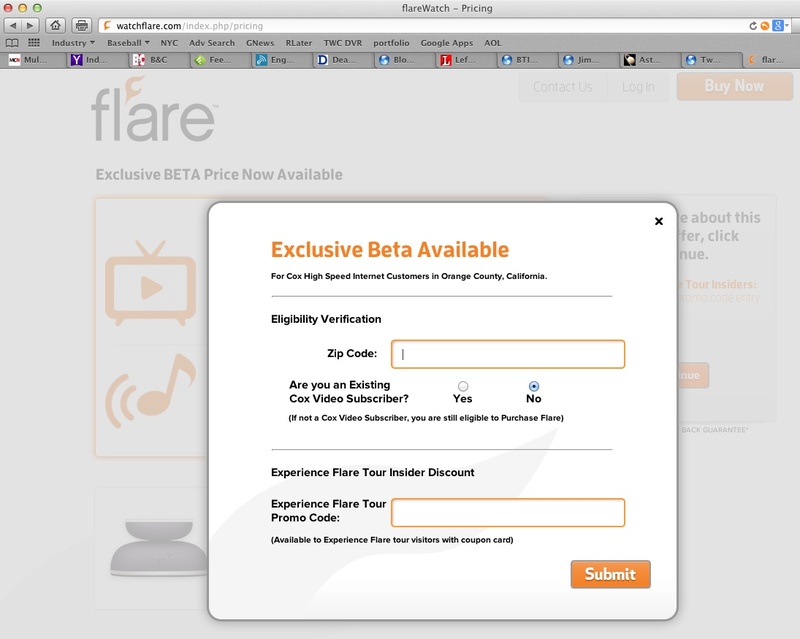 Update (4 November 2013): Donohue's interview with Cox's CTO Kevin Hart who said that Flare customers were buying the service in addition to Cox's video, which seems surprising and counter-intuitive.